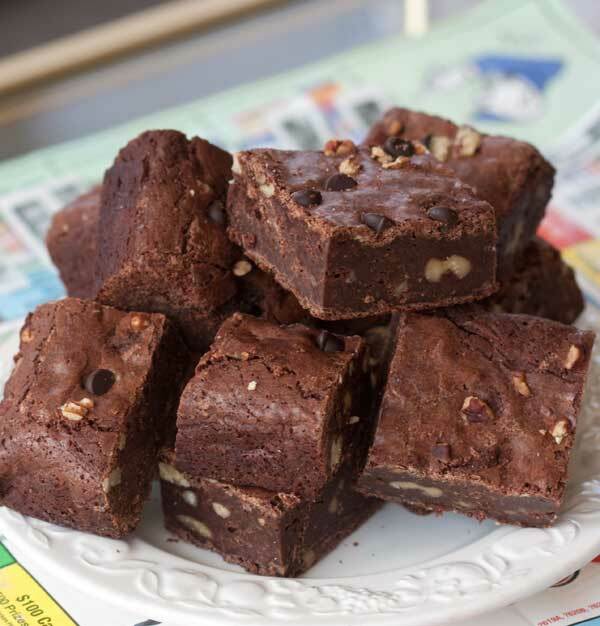 Root beer extract gives these thick fudge brownies a hit of root beer flavor. It's subtle, but there. For more root beer flavor you can increase the extract. Also, these brownies are at their best on day 2. They're okay on day 1, but refrigerate them overnight and they're even better. Preheat oven to 350 degrees F. Line a 9 inch square metal pan with nonstick foil. In a large, microwave-safe bowl, melt the butter, unsweetened chocolate and chocolate chips together at 50% power, stirring every 40-50 seconds, until mixture is melted and smooth. Alternatively, you may do this in a double boiler. Add the 1 cup of granulated sugar to the hot melted chocolate mixture and stir gently. Set aside. Whisk together the 1 cup of brown sugar with the 4 eggs. Whisk in the vanilla and root beer extract. With a heavy scraper, gradually stir the egg mixture into the chocolate mixture. Whisk together the flour, salt and baking powder. With the scraper, fold the flour mixture into the chocolate mixture until smooth. Batter should be glossy and shiny. Stir in the nuts. Scrape the batter into the pan and bake on center rack for 35-38 minutes or until internal temperature of brownies registers 212. Allow the brownies to cool at room temperature, then cover with foil refrigerate overnight. To toast the nuts, bake them on a cookie sheet at 350 for about 6 to 8 minutes.